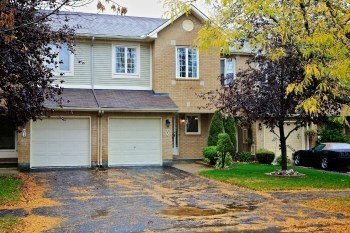 Move right in to this gently cared for spacious Kanata Minto townhome. Beautifully upgraded with hardwood and ceramic floors on the main and hardwood in the large upper main hall as well. Located across from a park on a quiet tree-lined street, you’ll feel great coming home to this immaculate town house. The main floor features direct access to the garage, large living and dining room joined by a cozy wood burning fireplace, and sliding doors to the large, double-tier back deck and nicely treed yard. The kitchen is chock full of cupboards with lots of counter space and over the counter lighting. Powder room is conveniently located off the large front foyer. Click here to view the Photo Gallery or Click here to watch the video on Youtube! Brand new carpeting has been installed on the stairs from lower level to the second floor. Three spacious bedrooms await upstairs. Wide hallway open to the staircase, flooded with natural light. Enter the double doors to the master suite and you’ll find lots of room for a king size bed and all the furniture, a four piece en-suite and a great walk-in closet. Downstairs you’ll find a fully finished rec room and loads of storage space. 6 great appliances, Central Vac, Central Air – what else would you want. Main roof was done in 2007, garage roof 2013. Extra attic insulation to approximately R42. Property Taxes $2758.35. Owned since it was built by a non-smoking retired couple with no pets – this home is pristine! Call Eric Manherz at 613-601-6404 today to find a home for you! Click on the Property Details attachment sheet below to see the specifications such as room sizes, etc.